Having a baby bump is no reason to be frumpy during sweater weather. Pick the right one for your new shape! t Finding the right maternity sweater can be quite a challenge. Often, sweaters can be boxy and can make an expecting woman look wider. Others can be too tight and too short, and make the body look round. Many women find it harder to find sweaters in the earlier months of pregnancy because the belly hasn’t rounded out yet. 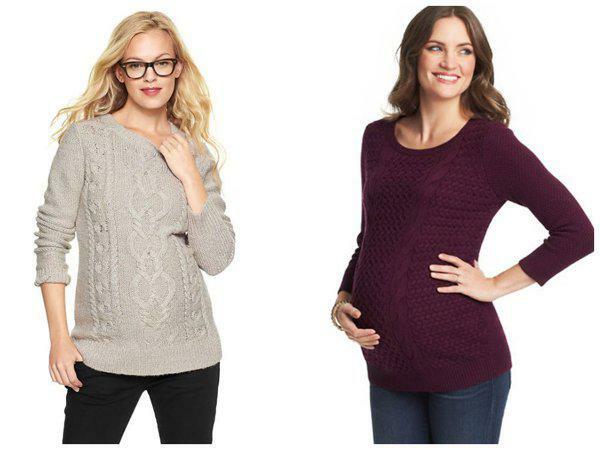 Here are a few tips on how to find a maternity sweater that is right for you, no matter how far along you are. t Cable knit sweaters are hot this winter. Find one that is just the right fit — not too loose and not too tight. If you are still in the first trimester and your bump hasn’t rounded out yet, the oversized look might be the way to go. When looking for an oversized cable knit sweater, make sure the sweater is long enough to go below your bump by at least a few inches. Also, pay close attention to the cut of the sweater. A square cut that is as wide as it is long will make you look boxy rather than stylish. t If you are going for a fitted look, find one that gets tighter toward the bottom of the sweater. That way, the knitted pattern will slope with the curve of your bump to help accentuate it. t Sweaters that have prints and patterns are all the rage this season. There’s no reason you can’t join in on the fun just because you are pregnant! The great thing about sweaters that have a fun print to them is that they make a statement, and they bring a great style to any outfit without much thinking. All you have to do is pair it with some solid bottoms, some boots or flats, and you’ve instantly got a great outfit. However, steer clear of sweaters that are too busy. A simple print or pattern will do the job just fine and will stay in style longer. That way, you can save it for the next pregnancy, and still look effortlessly fashionable. t Aside from the obvious purpose of keeping you warm, the purpose and style of a belted sweater is to provide room for a growing belly while at the same time providing shape to any body type. The belted sweater is one of the most flattering types of sweater for an expecting woman, and also the most comfortable to wear. Find a belted sweater in your favorite color and let it be your go-to sweater this winter. t With these tips, you should be able to find a sweater that is right for you and your baby bump. We still have a few months left of winter, so enjoy the sweater weather and keep those bumps warm and cozy.